When she married, Ilah was 85 years of age, and her groom Robert Henderson 82. They were married by Ilah's nephew, the Revd Robert Molby (member #579 of the Sackett Family Association), and she was walked down the aisle by Rev Robert's brother Eugene Molby. Rev Robert relates that, in asking him to perform the ceremony, Ilah told him, "I have taught school all my life, traveled a lot, worked at Estes Park, Colorado, in the summers, taught piano lessons, taught Sunday school classes, and numerous other things, but I have never been married. I think I will try that next." Only after he had agreed to officiate did Ilah inform her nephew of the name of her intended groom. Thurmon King's database, 64563 Martha Ilah Sackett. "Iowa, County Births, 1880–1935", database, FamilySearch, "Sackett, unnamed female, b. 22 Nov 1896, Berea, Adair, Iowa, d. of Gibson E Sackett, 39, & Elizabeth Jane Murphy, 29." "Iowa, Births and Christenings Index, 1800–1999", database, Ancestry.com, "Sackett, unnamed female, b. 22 Oct 1896, Berea, Adair, Iowa, d. of Gibson E Sackett & Elizabeth Jane Sackett." US Social Security Administration, "Social Security Death Index", database, American Ancestors, "Martha I Henderson, b. 22 Oct 1896, d. 3 Nov 1987, last res. 66968 Washington, Washington County, Kansas, SSN issued Kansas (1955)." Death certificate for Martha Ilah Sackett in possession of nephew Robert Molby states: b. Iowa 22 Oct 1896, d. Belleville, Republic County, Kansas, 3 Nov 1987, husband Robert B Henderson. "U.S. Social Security Applications and Claims Index, 1936–2007", database, Ancestry.com, "Henderson, Martha Ilah Sackett, b. Greenfield, Iowa, 22 Oct 1896, d. 3 Nov 1987, father Eligah G Sackett [sic], mother Elizabeth J Murphy. Listed 15 Nov 1962 as Martha I Sackett. 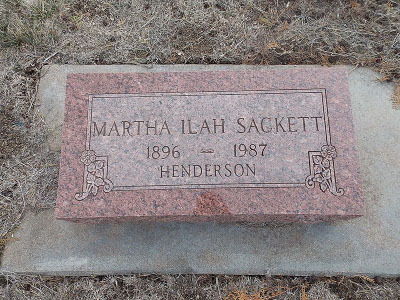 Listed 19 Oct 1982 as Martha Ilah Sackett. Listed 22 May 1998 as Martha I Henderson." The Belleville Telescope (Kansas), digital image, Newspapers.com, 7 Jan 1982. Sackett, Martha I, dau, b. Oct 1896, 3, b. IA, father b. IL, mother b. IA. Sackett, John W, son, 1/12, b. OK, father b. IL, mother b. IA. Sackett, Leota, dau, 15, b. OK, father b. IL, mother b. IA. Sackett, Ilah, dau, 33, single, b. IA, father b. IL, mother b. IA, teacher, public school.